Cpl. Enoch Benner raises the flag on July 4th. Sangin, Afghanistan — Marines working at and passing through Forward Operating Base Jackson around dinner time today will get a 4th of July menu that includes grilled pork ribs, beef patties and Italian sausage. Rumor has it that someone has got a cake, too. Otherwise, it’s a work day for 1st Battalion, 5th Marines’ 1,000 plus Marines, who will be hauling supplies, going on patrol and monitoring the enemy as they do each day. At the Battalion Aid Station, where the American flag does not normally fly because of the frequency of rotor wash from helicopter traffic on the landing zone, the Stars and Stripes were raised at 0800 by Cpl. Enoch Benner… just for the day. 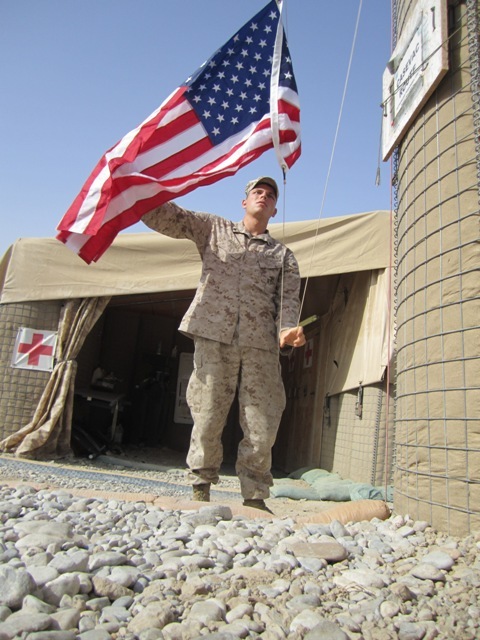 God Bless Our Marines and all our troops, not only this 4th of July but every day…you keep our nation safe. I so hope the food was worthy of your service!! God Bless the USA..
God bless our troops for putting their lives on the line to protect our freedom. As we celebrate our independence day you are all in our thoughts and prayers! Any time I see the flag being raised it is special and especially in another country by one of our great military members. Hooah!